This tutorial will teach you, How to get your Flickr Album ID? 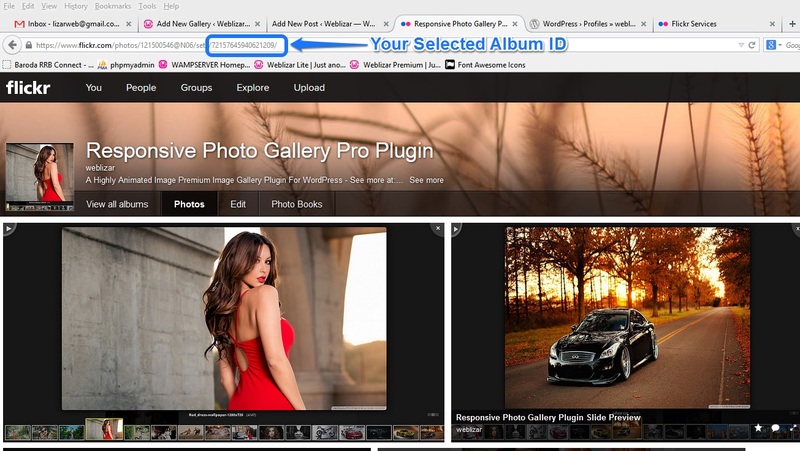 We are explaining very easy and simple three steps tutorial to get your Albums ID from Flickr account. First you needs to login in your Flickr Account. Follow this link to redirect you to Flickr Account Login Page. After login Flickr will redirect you to Home Photostream Page as below snap. Hover your cursor on first menu link YOU, then a drop down menu will be appears. Select the Albums menu link to go you photo album page. Previous step will show album page on your screen same as below screenshot. Click on any Single Album to open that photo album as we selected the first photo album in below screenshot. Now selected album has been opened. Check the Browser URL to get your Album ID as instructed in below screenshot. Here “72157645940621209” is our Album ID. How can I show for a user the page of 2 ? we can see only first page! You can use or activate activate multiple widget for this. I am entering my API key and album ID properly, but I keep getting the message Error Generating Gallery. 1. Make sure all your album published a Public content on your Flickr account. Share your API key & Album IDs with us. We will try keys on the local system to create the gallery. 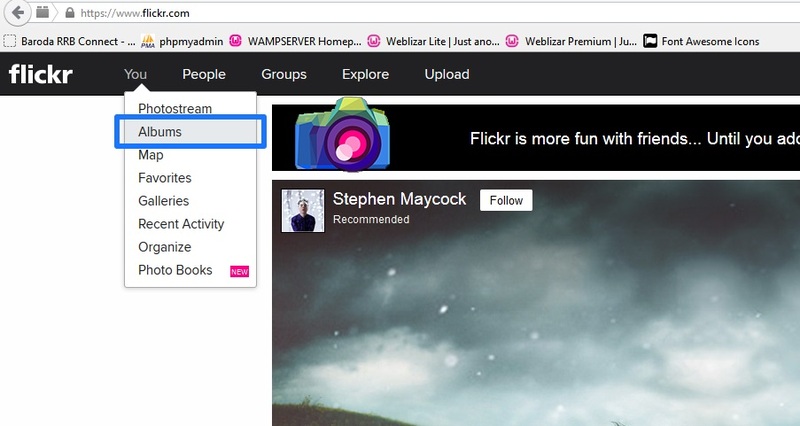 How do you show ALL Flickr albums on a page? Create all individual Albums through plugin. Collect the all Album shortcode. Create a page and paste the all shortcodes one by one. I have spent several hours trying to het ths to work but usually get “Error generating gallery” message, although I did also once get a spinning sort of processing thing that just kept on going. Tried generating new API keys; tried different flickr albums; “Show Gallery Title” on and off and copied and pasted, re-pasted album IDs but no joy. I can’t belive this is so difficult, so I must be missing something really obvious. Help before I go back to hosting all pictures locally. We got your message about the plugin, it’s not working on your site. I guys, I’m using your wonderful plugin, really thank you. Only a thing: Flickr devided my album in two pages. if I use the album ID with the automatically generated shortlink on my website I can see only the picture in the first page of the album. How can I solve this problem? Really thank you. Hi! Where can i send the API key & Album ID cause i have the same problem….preloader ingfinte loop…. May be it’s due to JS error. Could mail us your site temp access details? Hi! I have a question, if I buy the plugin, Can I will remove this (Flickr Album Gallery Powered By: Weblizar)? 1. 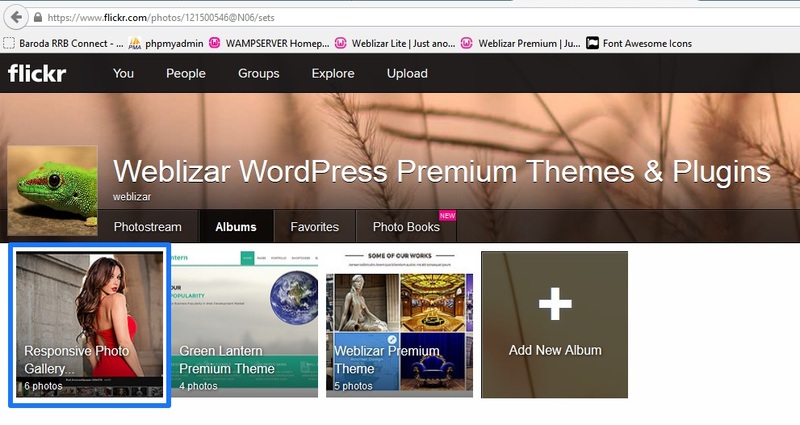 I have the same question if i buy the plugin, can I remove this (Flickr Album Gallery Powered By: Weblizar)? 2. is visa possible or only paypal? In Pro version, we don’t show credit link. You can use your visa card to make payments through PAYPAL. We have two more payment gateways enabled but I’ll suggest you make payment through PAYPAL since it is more trusted and secured way of payment transmission. Visit this link for more information. Can we show album as it is show in flicker account. Now i am put album id than show only photo stream photo but we need to show album folder wise. how can do that? My thumbnails are staggered on the page…that is to say the first row might have all thumbnails, the second row might have one missing, the third row might have all thumbnails. I do get the full number of thumbnails set on my limit. I am using the PageLines theme on the latest version of WordPress 4.9.1. My site is a WordPress MU site. I have set the page limit to 30 thumbnails and have tried 3 and 4 column layouts. Both layouts exhibit the same problem. I am assuming there is a conflict of some sorts with my theme. I was using Awesome Flickr Gallery and it didn’t have this issue. Hi, please share your website URL. To make future communications regarding any type of product support, please visit our helpdesk.